Hi everyone! Sorry this post is up late today, but my daughter and I are both feeling under the weather. 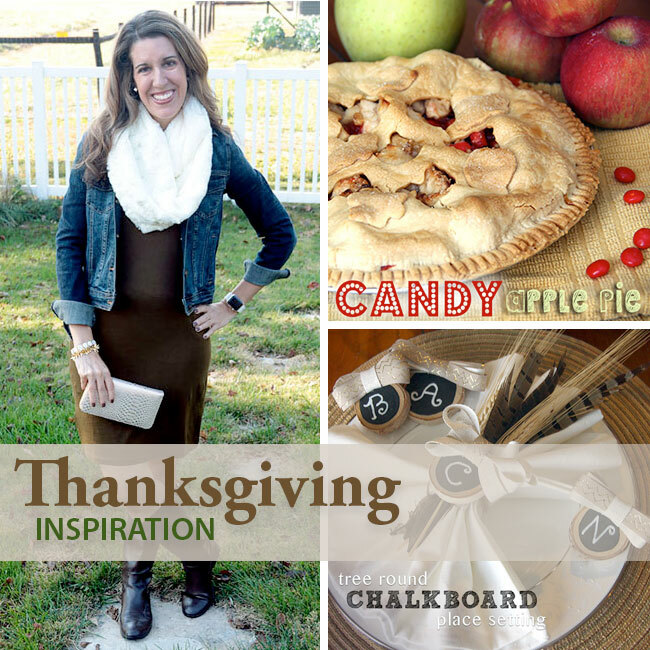 🙁 Thanksgiving is NEXT week and I wanted to share with you some food, clothing and decorating ideas from my blog! 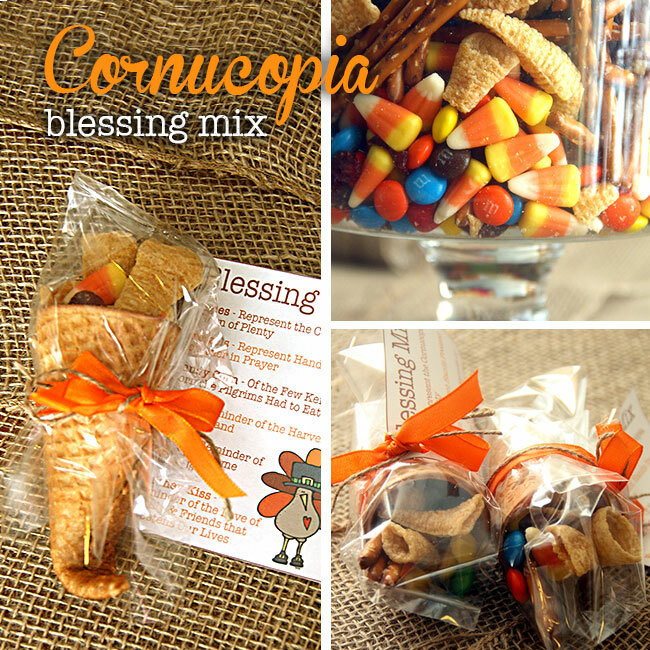 I made this Cornucopia Blessing Mix for Autumn’s Daisy Scout treat one year, but this would also be a delicious trail mix to make up in a bowl for your Thanksgiving get together, for the kids table or to send home with family and friends. This is hands down the BEST salad ever! I make this anytime someone asks me to bring a salad and I’m always asked for the recipe. 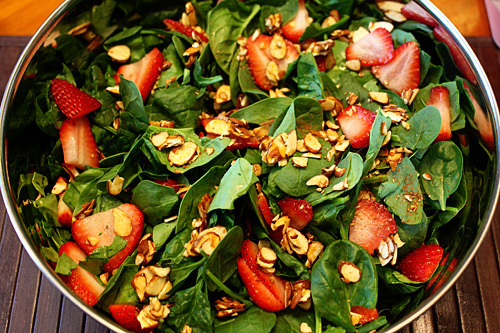 It is a Strawberry Spinach Salad with Poppy Seed Dressing and Candied Almonds. This drink reminds me of an apple cider, but MUCH, much more. This is one of my favorite drinks to make this time of year! 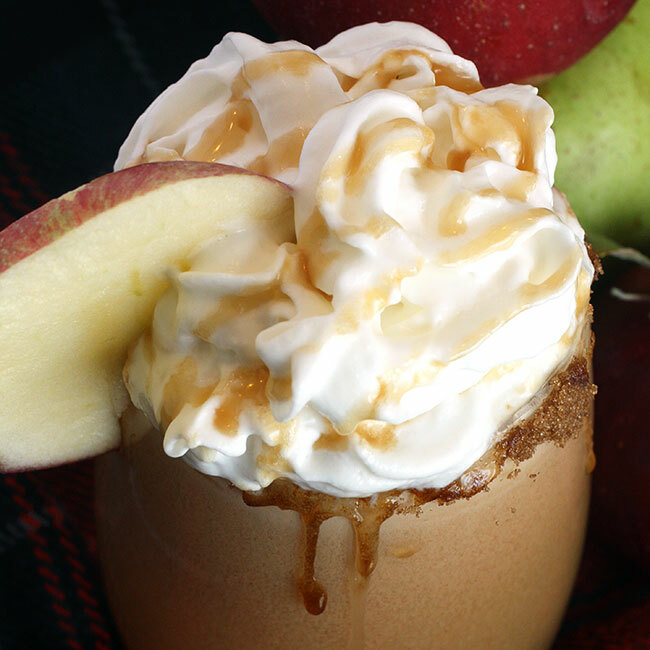 Creamy Caramel Hot Apple Cider! 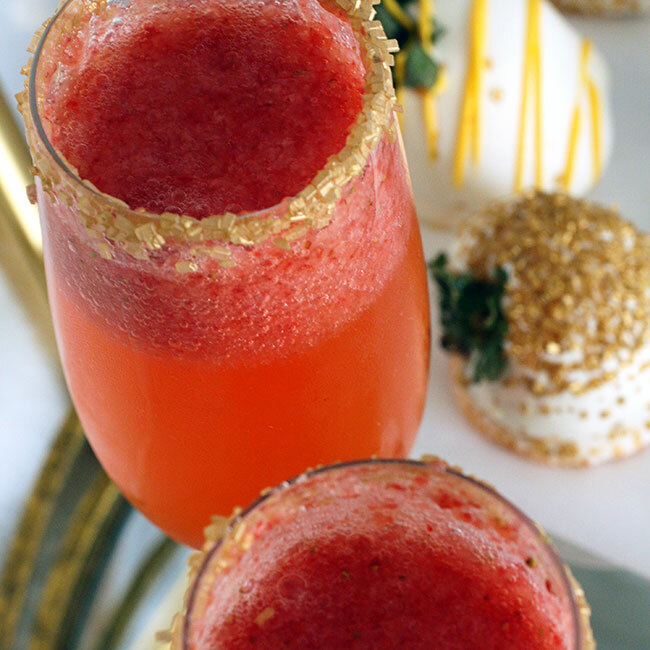 This is a simple twist on regular champagne, surprise your guests after dinner with a homemade Glitzy Strawberry Champagne. Looking for a twist on your usual apple pie? 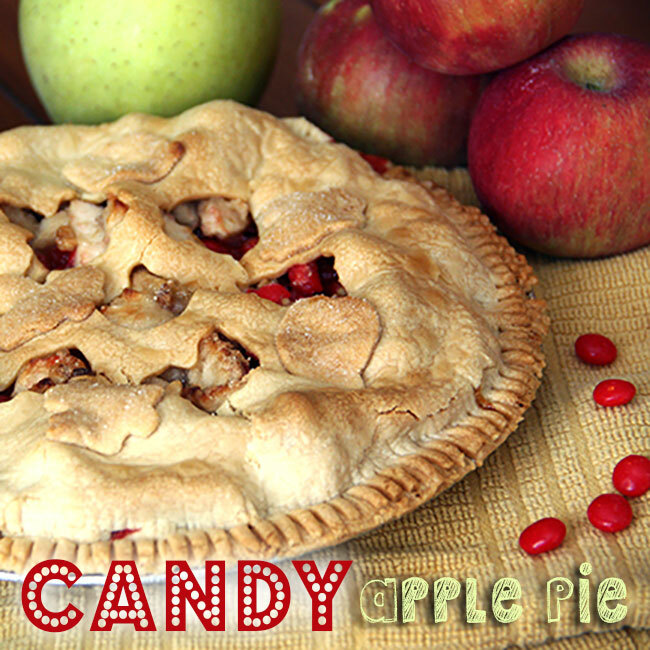 Try my Candy Apple Pie! One more apple pie dessert… Can you tell I love apple pie? 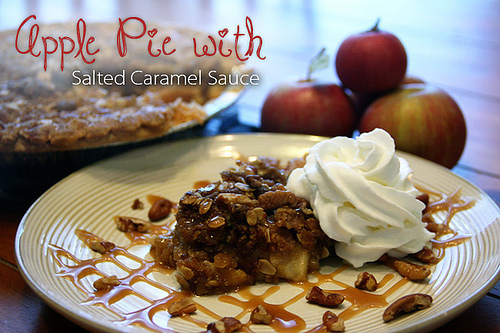 But, Apple Pie with Salted Caramel Sauce? Yes, please! This is what I am planning on wearing for Thanksgiving this year, I shared How to Accessorize a Simple Olive Dress over on the blog earlier this month. This scarf even holds my iPhone 6 Plus with a hidden pocket! 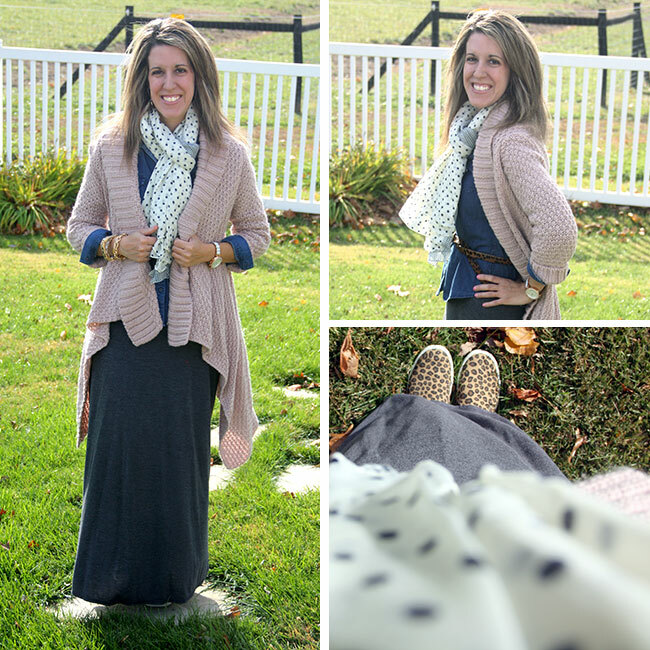 Last year I shared this super comfortable outfit with a flowy leopard blouse, leggings and burgundy leg warmers that pick up some of the burgundy in my scarf. This oversized knit cardi is a perfect ‘blanket’ to wear after over-indulging on delicious foods! I also paired it with some leopard slip ons! If you’re looking for a way to ‘dress up’ a casual look, add a blazer to it! That’s what I did in this Blazer and Coords Love post. 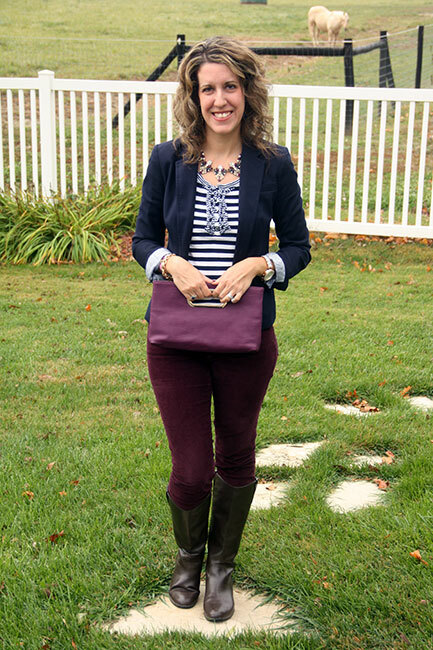 The navy and burgundy colors worked well together! 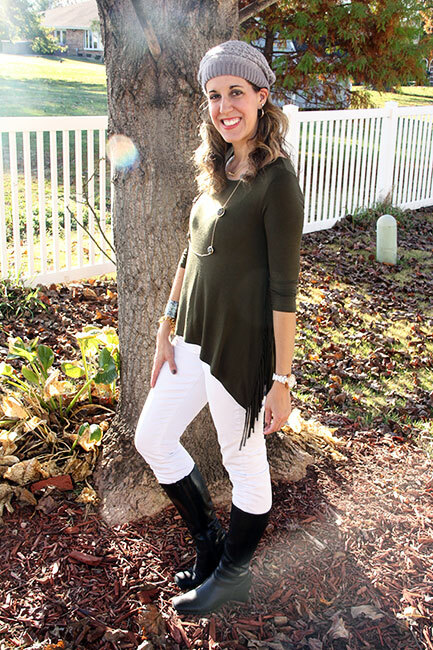 White pants are always perfect in the fall, they go great with olive, burgundy, tans… ok, they go well with everything! I wore my fringe olive top and a gray beret for this casual yet chic look. 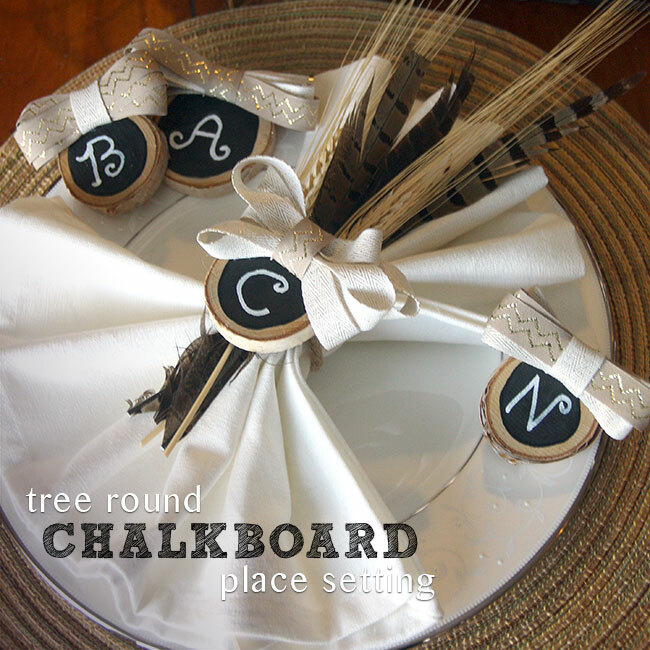 I love to craft with tree rounds and this Tree Round Chalkboard Place Setting is perfect for Thanksgiving and just anytime of the year! I also added a bow in neutral colors to the tree slice to glam them up a bit. Tuck in some wheat and feathers with your napkin and it gives it a nice fall vibe! 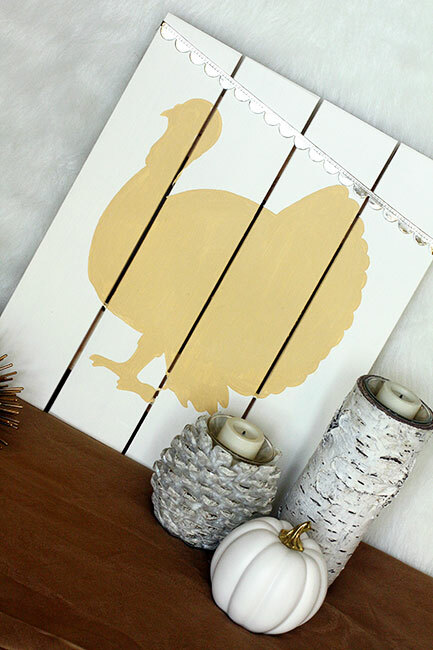 Last year I made this Neutral Turkey Palette. 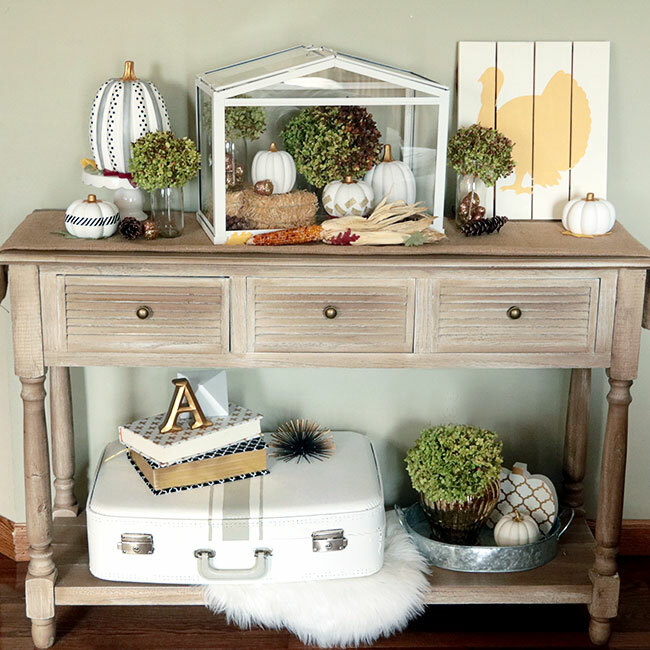 It was perfect on my new console table this year, which you’ll see pictured below. For Thanksgiving, I like to keep my decor simple. I will have some pumpkins set out here and there and I also love bringing in dried hydrangea blooms from my limelight hydrangea bush that is outside. 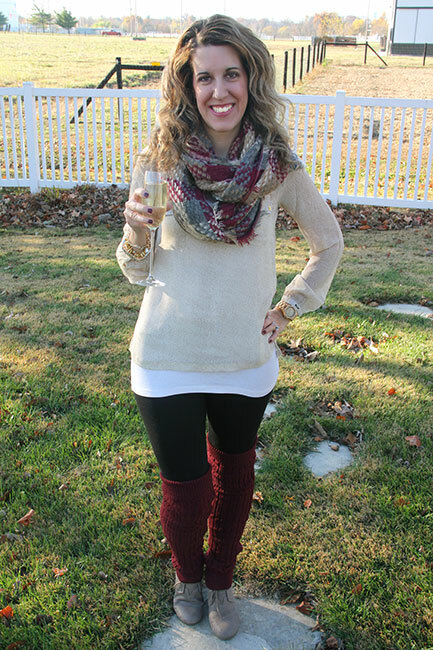 I also have a post where I share some of my Thanksgiving Meal Picks, be sure to check it out!